En suite kitchens free parking and Wi-Fi and plenty of on-site services make the pet-friendly Extended Stay America - Columbia - West - Stoneridge Dr. a great home base near the zoo and botanical gardens. Each of the hotel's 72 rooms on three floors offers a fully equipped kitchen free local calls and a sofa bed. Jump-start your day with a free grab-and-go breakfast that includes a variety of breakfast bars and muffins hot cereal coffee and tea. There's a fitness room on-site. Wi-Fi is free. Freshen up your wardrobe in the on-site laundry facilities. Parking is free and pets are permitted. 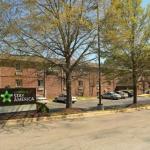 Situated across the Congaree River from downtown Extended Stay America is located in West Columbia just off I-126. You can enjoy the Riverbanks Zoo and Garden a half-mile away or you can hike the trails along the Three Rivers Greenway one-and-a-half-miles north. Shop until you drop at Dutch Square Mall two miles away or hunt for bargains at the Old Mill Antique Mall in West Vista four miles south. Columbia's historic charms including the Governor's Mansion the South Carolina State Museum and the Hampton-Preston Mansion and Gardens are 10 minutes east. Columbia Metropolitan Airport is nine miles south of the property.